All you need to start walking away your waistline is a comfortable pair of walking shoes. Walking is the most basic form of aerobic exercise that just about anyone can use to burn calories and boost energy levels. Your walking speed plays a role in how many calories you burn, and thus, how much weight loss potential you can expect. Whether you plan to hit the treadmill or the neighborhood walking trails, monitor your speed to efficiently work toward your weight loss goals. You may have heard of the fat-burning zone, which is defined as exercising at about 55 to 65 percent of your maximum heart rate, or MHR. Your MHR is 220 minus your age. When exercising within the fat-burning zone, your body tends to burn the highest percentage of calories -- about 60 percent -- from fat compared to other exercise intensities. A moderate walking pace of about 2 to 3 mph is intense enough to put the average person in the fat-burning zone during a walk. To be sure it's the right speed for you, check your heart rate periodically during your walk to see if it falls in the 55 to 65 percent range. Although walking speed that falls within the fat-burning zone is ideal for burning a high percentage of calories from fat, it's not the best way to burn maximum calories. Faster walking speeds burn more total calories, albeit from carbohydrates and fat. The key is to walk at a speed that gets your heart pumping at about 75 percent of your MHR. Aim for between 3 and 4 mph to achieve this intensity level. If the intensity level is tough to maintain 30 or more minutes at a time, do three or more 10-minute sessions throughout the day. There are a couple ways to track your walking speed when off the treadmill. There are several smartphone apps that offer a simple speedometer to help you track speed while you walk. You can also use a cardio watch that tracks heart rate, speed, steps and other useful health stats. A third method is to use a simple breathing test. If you can hold a conversation with a walking partner without gasping for breaths, you're walking at a moderate pace in the 2 to 3 mph or less range. However, if you find that you need to gasp for breaths every sentence or two, you're walking at a more intense pace of 3 to 4 mph, or possibly higher. As a reference, a light jogging speed is around 4 to 5 mph. You can integrate intervals into your walking regimen to boost the number of calories burned. Intervals work by alternating periods of moderate-intensity walking with short bouts of vigorous walking; the higher the intensity, the better. You can use interval training walking outdoors or on a treadmill. A sample workout could include walking at a moderate 3 mph for three minutes followed by three minutes of walking at a very brisk 4 to 5 mph. Repeat this cycle until you've completed 30 to 60 minutes of walking. On the treadmill you could increase the incline of the deck instead of speeding up the belt to achieve a more vigorous intensity during each work interval. You have to burn about 3,500 calories to lose one pound of bodyweight. This sounds like a lot of extra calories to shift the balance from weight gain or maintenance, over to weight loss. However, walking regularly can chip away at this figure over the long term. For example, a 200-pound person burns about 396 calories walking at 3 mph for 60 minutes. At a 4 mph pace, the same person would burn about 468 calories per hour. 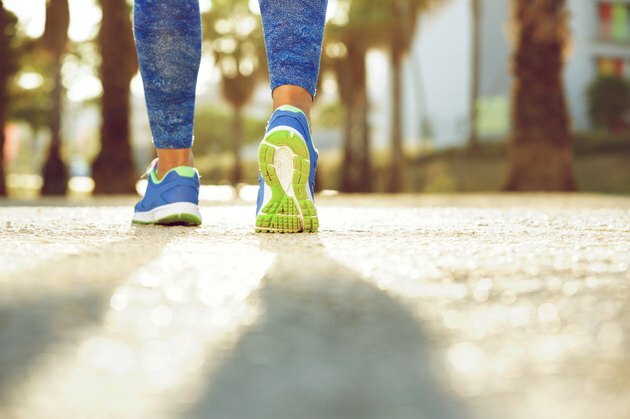 If you can manage to burn an average of 400 calories per workout, it would take fewer than nine walking workouts to burn a total of 3,500 calories. Walking five times per week would put you on pace to lose two pounds per month, which is a viable weight loss goal. IDEA: Interval Training -- The New and Better Way to Train Your Clients?